Nosh Cookbook | Recipes. Food. Kitchen Chaos. carbonation and flavor for less than conventional fizzy drinks. On top of that, it's a probiotic. Do you remember the first time you tried sipping coffee? More than likely, unless you had converted the coffee into a creamer cocktail, you probably thought it was disgusting. Maybe you tried it again after a while or drank it just for the caffeine. Slowly you learned to tolerate, and maybe even enjoy what you once thought putrid and miserable. While that sounds like a deep, existential crisis-inducing metaphor for life, it's certainly how myself and others started liking kombucha. What do you do when you go to the fridge to make dinner and the only thing you have is some eggs? Why not make Shakshuka? Shakshuka (Berber, meaning to shake) is a vegetarian dish that consists of grilled veggies of your choice, spicy red sauce and poached eggs. I added a bit of Feta cheese to the mix but you can make it your own. It's easy to make this one pot Middle Eastern / Jewish dish in a cast iron skillet where you literally cook the eggs in the sauce. You can add everything from mushrooms to potatoes but this doesn't have to be only a breakfast dish. In fact, Shakshuka has been reinvented over and over again in many forms throughout many countries. The Spanish add chorizo (sausage) and fry their eggs ahead of time. Indian Shakshuka consists of adding coconut milk and ginger. You can serve it on rice, toast or simply by itself. Give it a go, you may never make eggs the same way again. Who has the best french fries? 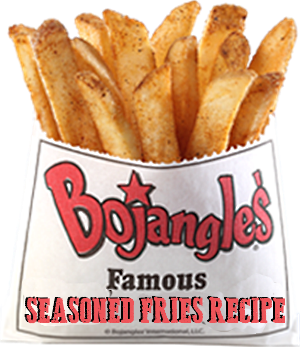 If you live in the south many people would argue Bojangle's Seasoned Fries with their Cajun spices are number one. I would say they're better than Wendy's, McDonald's or Burger King but then again I love a bit of spice in my life. What happens when you're craving both Italian and a cheeseburger all at the same time? Why not make an Italian cheeseburger? While I highly doubt Italians actually eat or created this dish, it's no doubt a rare find these days even in America. New Jersey or New York seems to be a hot-spot for finding anything with an Italian accent. I am told that many people also put French fries on their buns, which frankly sounds delicious, but I leave that up to you whether or not you want to take this recipe to the next level. Unfortunately, I ate this without a bun because I can't have the bread, but most of the time you just toss a hamburger patty on a bun with some red sauce and a bit of cheese and ba-da-bing, ba-da-boom you've got an Italian cheeseburger. I also grilled up some sweet yellow onions, some fresh mushrooms, and used a slice of tomato on each patty. Lately, we've been doing a lot less cooking at home due to money and time constraints. 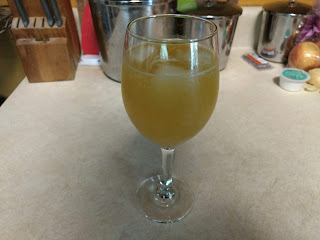 So I figured it was time to dig into the Nosh archive for some flavors from the past. Spanish meatballs, called Albondigas is a unique take on a global gastronomic genre that varies throughout the world from culture to culture. Personally, I prefer a mix of pork and beef in my meatballs but there's all kinds of variations. From India's curry koftas to Bosnia's Cuftes filled with mashed-potatoes, there's an endless amount of ways to make meatballs. You can deep fry them like the Danes or even cook a hard-boiled egg inside them as you might find in Mexico. 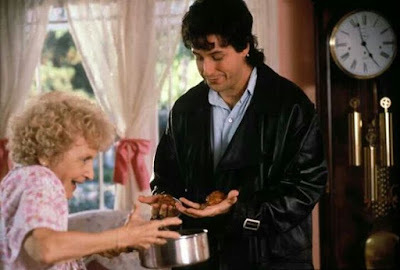 But for now, here's a simple, back to basics, Albondigas meatball recipe you can serve with some Spanish or Mexican rice upon which you can build your own culinary adventure. "That is the original 11 herbs and spices that were supposed to be so secretive," he says with conviction. I've yet to try the recipe and I'm uncertain if the Ts corresponds to tablespoons or teaspoons (based on the quantity, I'm thinking teaspoons). 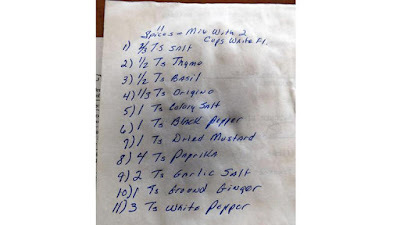 But give it a go, and let me know if this original Kentucky Fried Chicken breading recipe is the secret spice mix or just another hoax. What truly makes the mystery more interesting is when the reporter attempts to get clarification from KFC, the PR contact refuses to answer the question.